U.S. 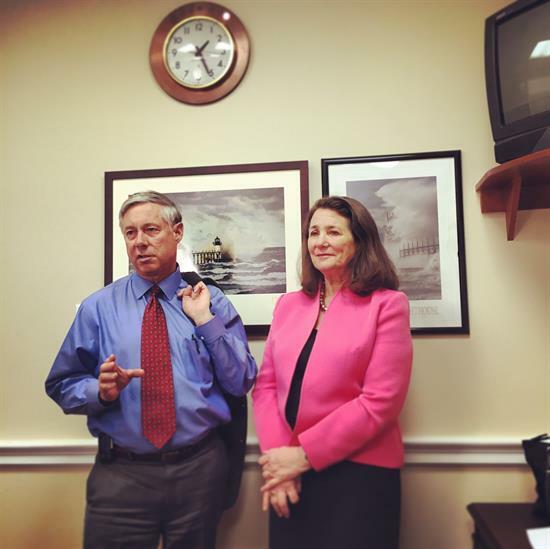 Representatives Fred Upton and Diana DeGette are leading the charge for passage of the 21st Century Cures Act. Photo: Office of Congressman Fred Upton. In a strong show of support for H.R. 6, the 21st Century Cures Act, 67 AACI cancer centers signed a letter to House Energy and Commerce Committee Chairman Upton (R-MI) and Ranking Member Diana DeGette (D-CO), thanking them for their efforts on 21st Century Cures. The cancer centers expressed their support for the bipartisan way that Upton and DeGette united to improve and expedite the discovery, development, and delivery of care. The cancer community was encouraged to see that H.R. 6 authorizes $1.5 billion per year in increased funding for the National Institutes of Health (NIH) over the next three years, and also language to provide an additional $10 billion in mandatory funding for the NIH Innovation Fund through Fiscal Year 2021. Cancer centers have struggled with flat funding from the NIH and National Cancer Institute (NCI) over the last several years. Additionally, our nation’s cancer centers voiced their approval for language included in the bill to increase funding to the U.S. Food and Drug Administration (FDA) by $550 million over five years. Predictable and sustained growth in NIH and FDA funding remains a priority for the cancer community. AACI’s cancer centers asked Chairman Upton and Ranking Member DeGette to ensure that the NIH Innovation Fund and the Cures Innovation Fund in the bill supplement, not supplant, the regular appropriations for the NIH and FDA. The House Energy and Commerce Committee unanimously approved the bill 51-0 on May 21 and the bill has garnered 171 cosponsors. H.R. 6 could be brought to the House floor for a vote as early as next week. Read the full letter submitted to Chairman Upton and Ranking Member DeGette. Today, the House Appropriations Subcommittee on Labor, Health and Human Services, and Education released its proposed Fiscal Year (FY) 2016 funding levels for the National Institutes of Health (NIH) and the National Cancer Institute (NCI). The proposal calls for approximately $31.2 billion for the NIH, a $1.1 billion increase above FY 2015 levels and $100 million above President Obama’s request for the Agency. The proposal calls for an appropriation of approximately $5.081 billion for the NCI, an increase of over $131 million. Additionally, the President’s Precision Medicine Initiative would be funded fully at the requested $200 million. While AACI maintains that a budget of at least $32 billion is necessary in order for the NIH to restore its lost purchasing power, the subcommittee is working with $3.7 billion less in FY 2016 discretionary funding than in FY 2015. AACI continues to advocate for a proportional increase for the NCI ($5.32 billion). Since 2003, the NIH budget has dropped over 20 percent, when accounting for inflation in the cost of biomedical research. The outlook has been just as damaging for the NCI. With excitement mounting about the scientific opportunities ahead and the potential to leverage the resulting advances to improve patient care, now is not the time to retreat from fully funding the NIH and NCI. The broad portfolio of research supported by the NIH and NCI is essential for improving the basic understanding of diseases and has considerably improved Americans’ health. A sound investment by the federal government in cancer research has led to advances in the understanding of cancer, and to new ideas that have the potential to accelerate progress faster than ever before. Our nation’s cancer centers continue to make strides in biomedical research thanks to the support of the federal government. Without sustainable and predictable annual budget increases for the NIH, research projects with the potential to discover breakthrough therapies would not be possible.